Grumpy: Morty, I've got an itch that's driving me crazy. Will you scratch my back please? Morty: Your back, yeah. I hope no one comes in. We look so silly. Morty: (in a high-pitched voice) I hope no one comes in. We look so silly. Paramutual Pictures is in trouble. Their films are doing well at the box office, but production costs are spiraling out of control. Head of the studio T. Paramutual (Brian Donlevy) has hired an efficiency expert, but decides that he needs someone unknown to investigate all parts of the studio incognito. And preferably, someone so stupid he won't even realize what he's doing. Cue the bumbling "movie sheet sticker-upper" Morty Tashman (Jerry Lewis), who's perfect for the part. Morty takes a job as an errand boy, and begins his inadvertent reign of destruction. Asked to deliver some script changes to the secretarial pool, he accidentally mixes the new pages with parts of other scripts, then causes general chaos when he stumbles over a desk, sending large stacks of typing everywhere. His confusion over whether to drop the boss' wife off at the doctor, or get the car�a convertible with the top down�washed first predictably results in a sudsy wife and water-filled vehicle. And when he's tasked with opening a huge bottle of champagne to celebrate a star's birthday, it's as if a fire hydrant has been opened. Lewis directed and co-wrote The Errand Boy, and while it's not bad, it's just not that funny either. There are some good gags, including one laugh-out-loud scene when he has to get a huge jar of jelly beans down from a high shelf, on a sliding ladder, and one where he's underwater holding his breath for an impossibly long time (which I won't ruin by giving away the punch line), but many of them fall flat. When he's accidentally taken home by glamorous but ditzy star Anastasia Anastasia (Iris Adrian), the results are predictable, and the outcome of the car wash scene mentioned above wouldn't surprise a second grader. While Lewis' some-time director Frank Tashlin cleverly integrated his direction with the gags, Lewis' own directorial work is far more workmanlike, even pedestrian. Not that it's clumsy or unskilled, but Lewis seems willing to do only the minimum necessary to convey the essence of the gag, and Tashlin's creativity is sorely missed. The writing is a bit suspect, too. There are two scenes where Morty interacts first with a silent clown puppet, then pours his heart out to Southern belle ostrich puppet, and we expect a revelation of a secret admirer, but there is none, and the scenes go unexplained. And there's one scene at the very end where Lewis compliments himself excessively�while it's indirect, the intent is obvious, and it's rather grating. Where The Errand Boy does work is in its affectionate portrayal of the workings of a Hollywood studio. Paramutual's logo is written in a script identical to Paramount's (who produced the movie), and it's always fun to take a peek behind the scenes at a "dream factory." Image Transfer Review: The black-and-white anamorphic image is gorgeous, with deep blacks, bright whites, and all shades of grey in between. Some scenes are slightly soft, but most have a lot of detail. There are a few speckles and one instance of horizontal lines running through the source print, but all in all this is an excellent transfer. Audio Transfer Review: The sound is clear and hiss-free. There's not a lot of dynamic range, but this is a movie from 1961, so that's unsurprising. Extras Review: The original trailer starts out in rough shape, but improves somewhat, in a transfer that's somewhat soft but otherwise good. The 2m:39s of bloopers are full frame, and one contains a brief commentary by Lewis' son. There are six full-frame promo spots, for a total of 1m:52s. Lewis and singer Steve Lawrence provide a commentary for 12m:29s of selected scenes. They sound like they're having fun, as Lewis talks about his use of video assist (necessary to direct himself), the importance of music in his films, and his regular actors. The most interesting comments here are Lewis talking about what he would have changed in his films, and recognizing his own self-indulgence. Subtitles in English and Spanish are provided for the main feature and the bloopers (plus French for the bloopers only). A surprisingly good French dub is also included. 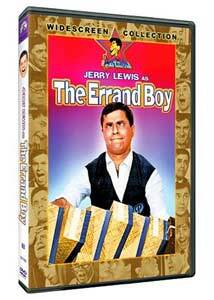 The Errand Boy isn't among Jerry Lewis' best work, and many of its gags are predictable, although its peek behind the scenes at Paramount in the early 1960s will be enjoyable for movie buffs. The extras are nothing to write home about, but the transfer is excellent.